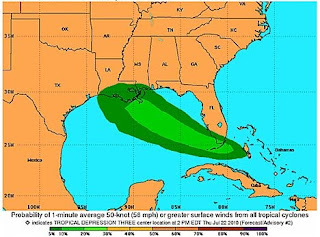 With all activities shutting down around the Deepwater well due to the projected path of Tropical Storm Bonnie, as it has now become, it is appropriate to quote the Press release from Admiral Allen today. Due to the risk that Tropical Storm Bonnie poses to the safety of the nearly 2,000 people responding to the BP oil spill at the well site, many of the vessels and rigs will be preparing to move out of harm's way beginning tonight. This includes the rig drilling the relief well that will ultimately kill the well, as well as other vessels needed for containment. Some of the vessels may be able to remain on site, but we will err on the side of safety. As I stated earlier today, I have directed BP to continue with the well shut in procedure while the work to kill the well is temporarily suspended. I have also directed BP to take measures to ensure the vessels operating the ROV's are the last to leave, and the first to return in order to maximize monitoring of the well. Monitoring of the site during the well integrity test remains one of the government's highest priorities. While these actions may delay the effort to kill the well for several days, the safety of the individuals at the well site is our highest concern. We are staging our skimming vessels and other assets in a manner that will allow us to promptly re-start oil mitigation efforts as soon as the storm passes and we can ensure the safety of our personnel. Kent Wells briefing on Thursday had little to add to this, though there was a little emphasis on noting that the Admiral had given permission for the well to be kept shut in. 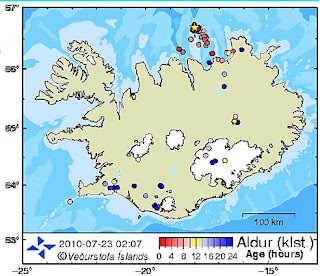 And just to remind us that there are other things that the natural cycle of the Earth can bring to our attention, there is a little more earthquake activity north of Iceland today, that we have seen in a while. But is remains relatively deep, at the moment. UPDATE: While this is offshore Northern Iceland there have been 3 subsequent earthquakes of 3.0 or more magnitude in the area (where the yellow star is) since I posted this. Stars are for 3.0 or larger, dots are for smaller ones and quite common along the rift line.